What I don't understand is how in England, 53 million inhabitants are 'paying'* €2.18bn per season to watch the top 20 clubs. I.e. each inhabitant is paying €2.06 per club, on average. In Germany, 80.6 million inhabitants are going to be 'paying' €1.16bn per season to watch the top 36 clubs (since the deal is for the top 2 divisions). I.e. each inhabitant is paying €0.40 per club, on average. Even if 2. Bundesliga clubs were to get absolutely nothing, each German inhabitant would only be paying €0.80 per Bundesliga club, on average. Basically, English people are paying considerably more money to watch football than Germans. * I used the word paying because ultimately the money being paid by the broadcasters is 'recouped' through subscriptions and advertising. 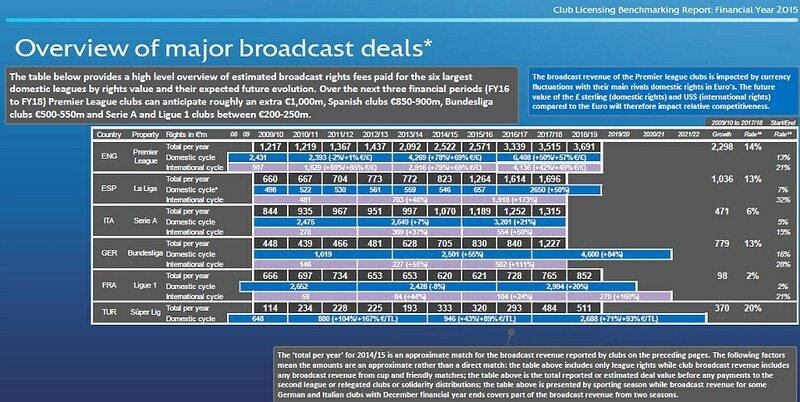 La Liga domestic deal is only 833M€ per season, but they get over 600M€ for international rights. Bundesliga sold international rights last season for 160M€. Nevertheless I think Buli signed a good deal, I only wish it was for 3 seasons and not 4.
pep4 wrote: La Liga domestic deal is only 833M€ per season, but they get over 600M€ for international rights. Bundesliga sold international rights last season for 160M€. Nevertheless I think Buli signed a good deal, I only wish it was for 3 seasons and not 4. MUTU wrote: What I don't understand is how in England, 53 million inhabitants are 'paying'* €2.18bn per season to watch the top 20 clubs. See this is exactly why im not that impressed with this new deal, but thinks its the minimum we should get in order to eventually just catch up to BPL and LaLiga. I don't get that BuLi vs BPL discrepancy either. It must simply come down to the pay tv market in Germany not being so mature, and not splitting the kick off times more perhaps? We should at least be able to get twice the amount La Liga is getting for their domestic rights! ...and not just 1,33 times as much! MUTU wrote: We're talking averages mate. It doesn't matter how fairly spread out they are, the average will still be exactly the same. Fair enough, but I'm referring to how much money the EL teams will actually get. A gap of 20 million at that level makes a huge difference, but it might be more or less than that in reality. Germans are reluctant to pay money in order to watch football on TV unlike the english. If they would only pay half as much as the British do! And why does it have to be for four years? British rights are worth more because SKY in Britain has almost 11m subscribers that pay much more than 4.5mil subscribers that SKY has in Germany and Austria...and plus BT making competition to drive the prices up. This is a great deal for the league, an 85% increase is a great return, making the BL second in europe. We could never compete with the money thrown about in England, and we shouldn't look to. Money has no value any more in England, the league is so heavily reliant on the tv money its laughable. I hope this means that more clubs are able to compete regarding transfer fees, this can only be good news for the league, if it is utilized well. Actually, the primary benefit for BL clubs as mentioned by Scholl I think, is that they can offer better contracts to their most valuable players, and that makes a huge difference because most german clubs don't rely on foreign players that much. And on top of that, they are not allowed to broadcast matches before 17:15 on Saturdays! It all started in the 1960s. Convinced by Burnley Chairman Bob Lord, Football League Chairmen joined forces to halt the airing of matches at 3pm on a Saturday. But why? Lord felt that big games being televised at that time would hurt attendances for smaller clubs, like his Burnley team. Reasoning that people would rather watch a big game than support their local team, these Chairmen feared the potential loss of match-day revenue that could occur. And so, based on that premise, with no real proof other than a hunch it came to pass that no match on a Saturday between 2:45 and 5:15 could be aired on TV within the UK. This has remained in place ever since, with the exception of the FA Cup final which has always been shown on a Saturday at 3pm until only recently when it was switched to 5pm in a controversial move by the FA. La Liga at the moment has the better deal than Bundesliga in international rights but Bundesliga is more accessible in the US on Fox than La Liga is on BeIN, therefore getting more viewers than the subscription channel BeIN is. This could reflect better on a future deal in favor of Bundesliga depending on ratings. PL, for example, is the most accessible league in the US since it's through NBC affiliates and at least one game per week in broadcast on a public channel. They have very high ratings and can demand more money. More visibility brings in more commercial partners and better image rights. How much of this deal goes to Bundesliga 1 vs Bundesliga 2? And how much of PL money goes to championship (none I believe)? In terms of top division, domestic TV revenue still seems lopsided even after the new deal kicks in..